appointment. Freshmen may substitute band for required military training with the permission of the director. 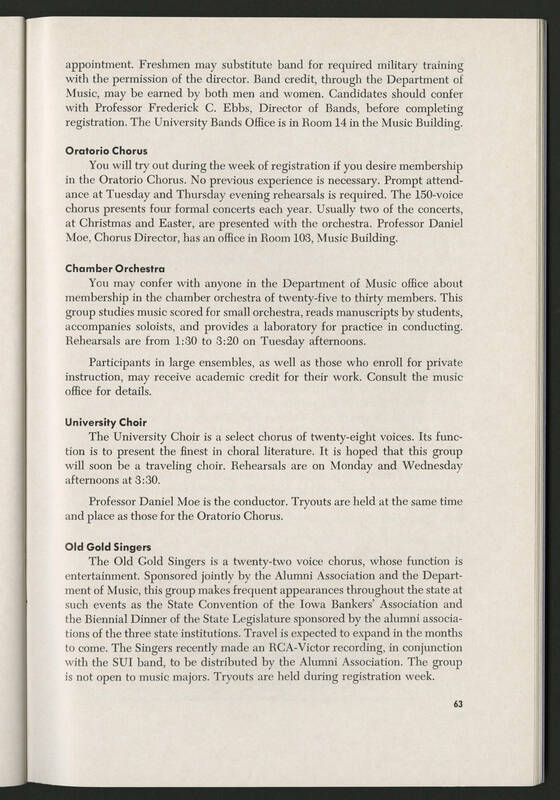 Band credit, through the Department of Music, may be earned by both men and women. Candidates should confer with Professor Frederick C. Ebbs, Director of Bands, before completing registration. The University Bands Office is in Room 14 in the Music Building. Oratorio Chorus You will try out during the week of registration if you desire membership in the Oratorio Chorus. No previous experience is necessary. Prompt attendance at Tuesday and Thursday evening rehearsals is required. The 150-voice chorus presents four formal concerts each year. Usually two of the concerts, at Christmas and Easter, are presented with the orchestra. Professor Daniel Moe, Chorus Director, has an office in Room 103, Music Building. Chamber Orchestra You may confer with anyone in the Department of Music office about membership in the chamber orchestra of twenty-five to thirty members. This group studies music scored for small orchestra, reads manuscripts by students, accompanies soloists, and provides a laboratory for practice in conducting. Rehearsals are from 1:30 to 3:20 on Tuesday afternoons. Participants in large ensembles, as well as those who enroll for private instruction, may receive academic credit for their work. Consult the music office for details. University Choir The University Choir is a select chorus of twenty-eight voices. Its function is to present the finest in choral literature. It is hoped that this group will soon be a traveling choir. Rehearsals are on Monday and Wednesday afternoons at 3:30. Professor Daniel Moe is the conductor. Tryouts are held at the same time and place as those for Oratorio Chorus. Old Gold Singers The Old Gold Singers is a twenty-two voice chorus, whose function is entertainment. Sponsored jointly by the Alumni Association and the Department of Music, this group makes frequent appearances throughout the state at such events as the State Convention of the Iowa Bankers' Association and the Biennial Dinner of the State Legislature sponsored by the alumni associations of the three state institutions. Travel is expected to expand in the months to come. The Singers recently made an RCA-Victor recording, in conjunction with the SUI band, to be distributed by the Alumni Association. The group is not open to music majors. Tryouts are held during registration week.